Cascade Painting & Restoration, Inc. In Portland, home painters can be a convenient way to deliver a professional paint job or real lifesavers for homeowners who are unable to complete their own painting project. Few homeowners relish the prospect of laying down newspapers or plastic and picking up a brush and edger. You should also know that painting your bedroom in your parent's home or your first apartment is a different project than painting an entire home, inside or out. Whether you're ready to move into a new home and don't want to wait or can't practically have rotating areas of your home consumed by the painting process for weeks, a Portland home painter can do a great job in just a few days. Other homeowners may simply not have the time to complete their own painting project. Dual-income households afford some luxury while making leisure time truly precious. Finally, professional Portland house painters will open several decorative options including specialty painting techniques or even murals or trompe loeil. Talk to a professional painter about these possibilities before you make a final decision. Exterior house painting in Portland is a project of an entirely different nature. 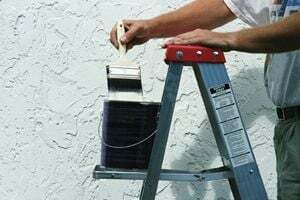 Dragging a ladder around your home with a paint tray is only the beginning of the difficulty in a quality paint job. Choosing the paint for your home and your siding is by itself a decision that requires a fair amount of expertise. Combining the wet climate of the Pacific Northwest with particular siding materials and knowing the best paint product often requires specific, regional knowledge. Moreover, there may not be a clear-cut right answer, as the cost of the paint must be balanced with varying life expectancies. Unlike interior house painting, you also have a certain window of time to have your home painted. The middle of summer is generally the best time to complete your exterior house painting. Not only does winter threaten to create delays with rainy weather, but many siding materials need some time to fully dry so they will absorb the paint. Inexpensive paint and a winter application can create disastrous results. That said, you should begin looking for a Portland home painter well in advance of the project, especially for an exterior house painting project. Quality house painters are in high demand, and you may need to wait a week or two for the contractor you want. Being flexible with your schedule will also ensure you can find a quality professional at a reasonable price, the backbone of a worthwhile hiring decision. Be wary of substantially lower estimates, however, as they may reflect inferior paint products or lower services. You can probably save a good amount of money, though, if you're willing to move your own furniture for the painter. The average cost of hiring a Portland home painter is about $2,000 for interior house painting and $3,000 for exterior house painting, although these numbers can fluctuate quite a bit. Recently, we've seen projects range from as low as $1,200 and as much as $6,000. The homeowner who spent $6,000 on an exterior house painting projects told us that he also received estimates for half this amount, but thought the quality of the work was worth the price. He said, "I believe that the house will not need to be painted again as soon as it would have had we gone with another company." Comment: I'm helping my mother-in-law do a little research. She want to have her home repainted possibly this summer and would like to get an idea of cost. The house is approx. 2700 sq. feet with two floors. There is a kicker though, she is insisting it be painted by hand and not sprayed. I'm not sure if this is even a thing painting companies do anymore, but if it is possible, we'd like to know how much it would cost. Thank you. Comment: I would like to get an estimate for painting siding. Comment: I have already started the paint work in my home, but its a lot to take on, so I am hoping to get someone to help finish the ceiling in my living room as well as the stairwell down to the basement. Along with all interior doors and trim. Comment: est to stain fence. Comment: Repaint small house with attached garage and small shed. Comment: Looking to paint the exterior of the house + trim. 3/4 of the house is aluminum siding over wood (so trim is somewhat recessed); 1/4 is newish wood siding. We had windows and some sills replaced in the fall; trim is currently primed but not painted. There's about 2 feet of cinderblock around the foundation (between the ground and where the siding starts). Portland Painting Contractors are rated 4.83 out of 5 based on 1,191 reviews of 116 pros. Not Looking for Painting Contractors in Portland, OR?